Just a reminder our next meeting is coming up this Monday March 11th, 2013. We will be at Murray’s house again, starting at 7pm. Let me know if you need location information. This month our theme is “Fountain Pens: Love ’em, and hate ’em”. Bring your favourite 2 fountain pens, and that one purchase that you’ve grown to dislike, and let us know what is makes it a fantastic pen, or is just plain awful. As always, our secondary theme will be new acquisitions. Bring your new pens, stationery, ephemera, et al. and share the joy with everyone! Something you want to see, or try? Let us know and we’ll see if we can rustle it up for you. You know the drill – please let us know if you’re coming or not so we can plan for space/chairs. Thanks, and we’ll see you on Monday. Just a reminder that our next meeting is coming up this Monday January the 14th. We will be meeting at Murray’s, starting at 7pm and running until about 9pm. After moving it a few months due to some other events, our main topic will be general pen repairs. So please bring along any pens that you would like to do some work on. I am pretty sure between Murray and John most tool needs can be met, as well as information and experience. There are several good repair books in the library. As usual, our secondary topic will be new acquisitions, old favourites, or anything else you would like to bring to show and share – be it pens, ink, paper, or related accessory. If there are any specific pens, inks, or paper anyone is interested in seeing, please feel free to make the request and we can see if any of our members is able to bring it along. From an email from Conway Stewart. Not sure if anyone local is carrying it yet. Conway Stewart is pleased to announce the launch of our new ink line with our working partner, Diamine Ink. We chose to work with Diamine because of their rich English heritage. Manufacturers since 1864, Diamine Ink has successfully incorporated the traditional methods and formulas for ink production which are water based, perfect for new and vintage fountain pens. 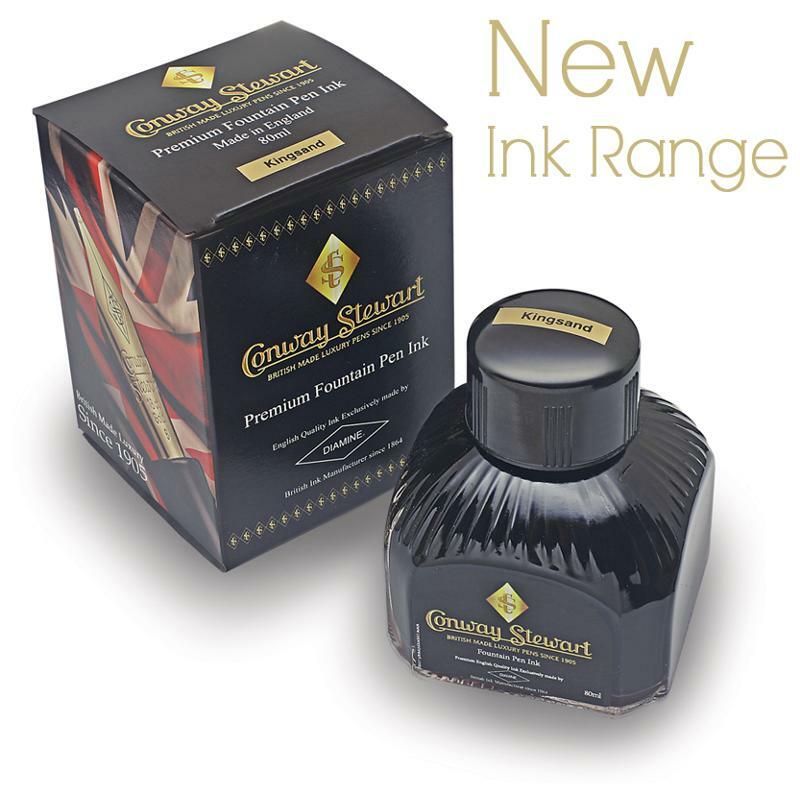 Launched in a choice of six colours and named after points of interest close to our factory in Devon, our new ink line is offered in the substantial 80 ml size bottles with exclusive Conway Stewart packaging. 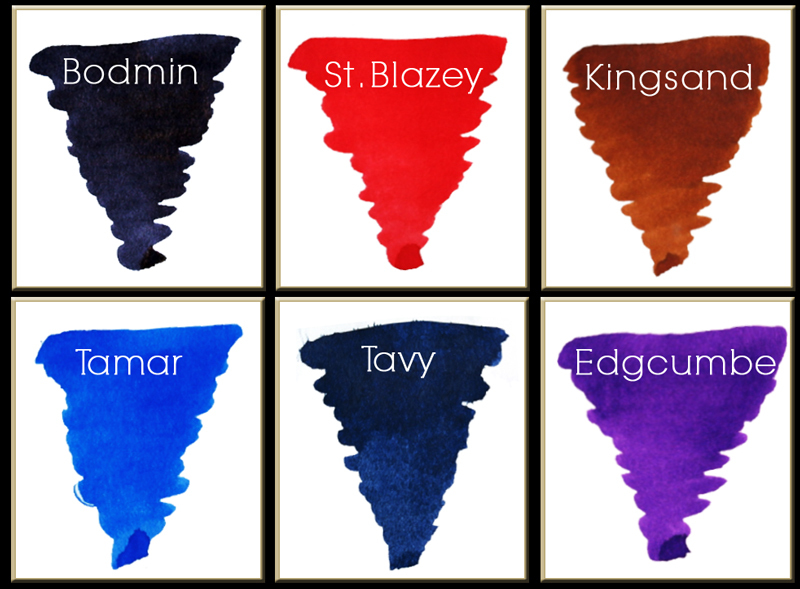 Bodmin Jet Black, St. Blazey Classic Red, Kingsand Ochre, Tamar Royal Blue, Tavy Denim or Edgcumbe Lavender — all are non-toxic which results in a free flowing ink to enhance your writing pleasure. Please note that due to computer, tablet and smart phone screens, the ink colours shown are to be used as a general reference. Available now for immediate shipping! Back in September a member proposed a group buy of ink from P.W. Akkerman in the Netherlands. They have their own line of beautiful inks, in 30 colours – each named after a place in Den Haag where they are located, in a unique bottle that holds 150ml. Interested members arrived at the October meeting with their requests, and an order for 14 bottles was placed. In November, the highlight of our meeting was the arrival of our order of ink. Akkerman’s unique ink bottle – uses a marble to trap the ink in the neck of the bottle to make filling easier. Akkerman was extremely pleasant to deal with, and their communication was great. They were quick to respond to e-mail, even with the time difference. The inks were shipped the day after I placed the order through their website – I highly recommend Google Chrome with the automatic language translation enabled. Everything arrived within two weeks, and was exceptionally well packed for shipping. 14 massive boxes, with bottles that had the lids taped as an extra seal, wrapped in plastic bags, and nestled in packing peanuts inside each individual box. The ink colour selection can be found here. The colour on the monitor does not do the ink justice. Scans of the ink samples will be posted shortly.